I picked up an Apple Macintosh 512k for Christmas. Though I am not much of an Apple guy, I always wanted one of these in my collection. So I'm trying to find a list of software, not so much for the 128k but for the 512k system. I've done several searches on the world wide web and haven't found a single, easy to read, list. I'm looking for both 1st party and 3rd party software that was available in the time frame that system was being sold. I know, I'm asking for a lot but can anyone help me? There isn't going to be a single list, you can stop looking. This isn't a platform like a video game console where everything had to be licensed for compatibility. It's an open, active computer platform, with a lot of enthusiast-level software in circulation. Imagine if you went looking for the definitive list of software that ran on an IBM PC 386-sx33 compatible processor, but not a 486-DX66. It's the wrong question. Your next best bet will be searching The Macintosh Garden around 1984. It's far more comprehensive, but also less curated. Anything running on System 6.0.8 or under is probably compatible with this yellow thang. Here's some more information about this particular machine, including a list of what came with it. LowEndMac page about FatMac. Not to piss in your soup, but the Mac Classic is a better (higher spec'ed, more compatible, likely far more reliable) take on this type of machine. I'm not looking for a better system. I'm more interested in a computer's place in history. I read all the time that the original Macintosh was groundbreaking yada yada yada and yet, I find there wasn't much software for it, at the time, based upon my own research. I'm wondering if I'm wrong which is why I'm looking for some kind of list. I will check out those links. Looks like I may find some answers there. Thanks Flo. No one was doing WYSIWYG desktop publishing at this price point in 1984. Just having a mouse in the box was a big deal. No one had (relatively, for the time) high resolution screens and pointing devices on consumer machines when these were new. Look up CGA or EGA games for a glimpse at nasty-looking "high resolution" PC graphics. The monochrome stuff on Mac wasn't as colorful, but it was sharper. Workgroup networking technology was much simpler on Macs for schools and small offices. High resolution printing from machines like the LaserWriter was hot stuff back then. Also recall that this thing was expensive, $6,000 in today's money, and not that useful for "most" people. I see that the 512K only supports up to Mac OS 4.1, which is circa 1986. Ouch. I get that you don't want to collect these, but you should also look at the Mac Plus and SE for educational comparisons. Your 512K Mac has some weird ports on the back that were not used on later machines. Your machine is not necessarily indicative of the capabilities of the platform, which became more popular after the revisions. I had a Mac SE in 1988 for college, and used it for about six years. It was "fun" to upgrade the RAM in that thing. The color and PowerPC Macs that came later were considerably more powerful and versatile. Needless to say, we've come a long way. 1. 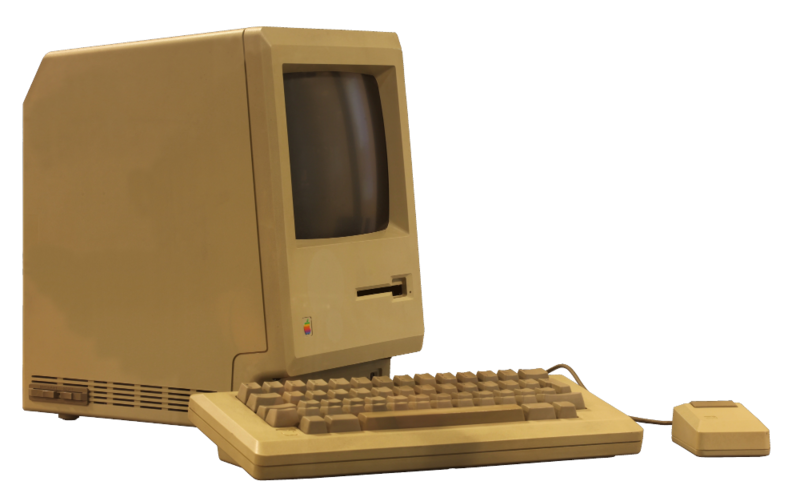 The Mac Pro's CPU, at 3.9GHz, is 500 times faster than the Macintosh 128K. And that's before taking into account the multiple-cores and Hyper Threading technology. 2. The Macintosh had 128K (hence the name) and the Mac Pro has a maximum of 128GB RAM (which is itself pretty amazing). That's 128000000K, giving the new Mac Pro a million times as much memory as the first Macintosh. 3. The Dual AMD GPU system of the Mac Pro is impossible to compare to the Macintosh 128K graphics system in any meaningful sense. The Macintosh 128K shipped with a number of chips to control the display, but none of them really equate to a modern GPU. It's listed by Apple as just 1-bit. 4. The Macintosh 128K's hardware was capable of powering a 512 x 384 display, although it featured a smaller 512 x 342 display. The Mac Pro is capable of powering up to three 4K monitors, each with 3840 x 2160 pixels. 5. You could fit 47 Macintosh 128K screens into the three 4K monitors powered by a single Mac Pro. OMG these how-to books are a delightful time warp back to 1984. I just picked one up as well, but the Floppy Drive isn't working. I might take it out and try and clean+grease the mechanical parts.